Sign up now and join the 60 minute dash frenzy as you try to make as much money as you can with $1,000 in free cash and stand a chance of being able to keep you winnings. 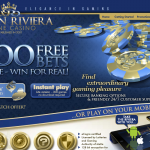 Golden Riviera Casino is offering players a $/£/€ 2,500 Free Play Bonus that can be used for 60 minutes to allow players the chance to walk away winners. This bonus is subject to wagering requirements. 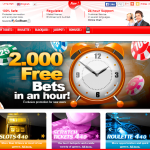 Casino 440 is currently offering players the chance to take advantage of 2,000 free bets just by signing up with the casino. Players will need to meet with specific wagering requirements to withdraw their winnings.